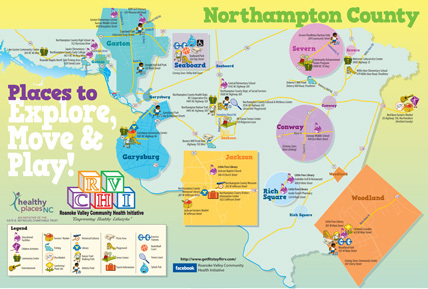 The objective in creating the map is to encourage residents of the Roanoke Valley to lead healthier more active lives and the Places to Explore, Move and Play map serves as a tool to help them become more active. 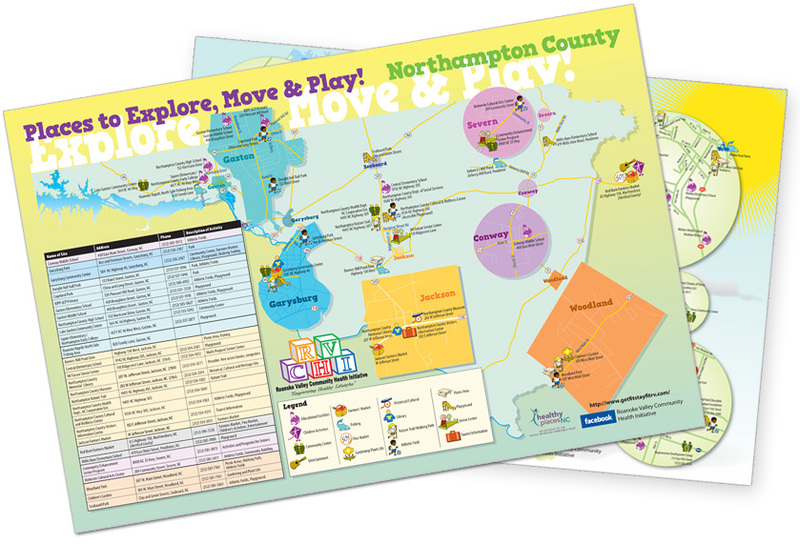 The comprehensive map also provides health tips; information for local medical facilities; park hours; and a list of elementary, middle, and high school sites with safe spaces to play. According to County Health Rankings & Roadmaps (http://www.countyhealthrankings.org/), the need for easy “go-to” resources such as the Places to Explore, Move and Play map are clear when taking into account that counties in the Roanoke Valley rank near the bottom of the list for positive health outcomes in comparison to the state. The rankings evaluate counties based on mortality (length of life) and morbidity (quality of life). 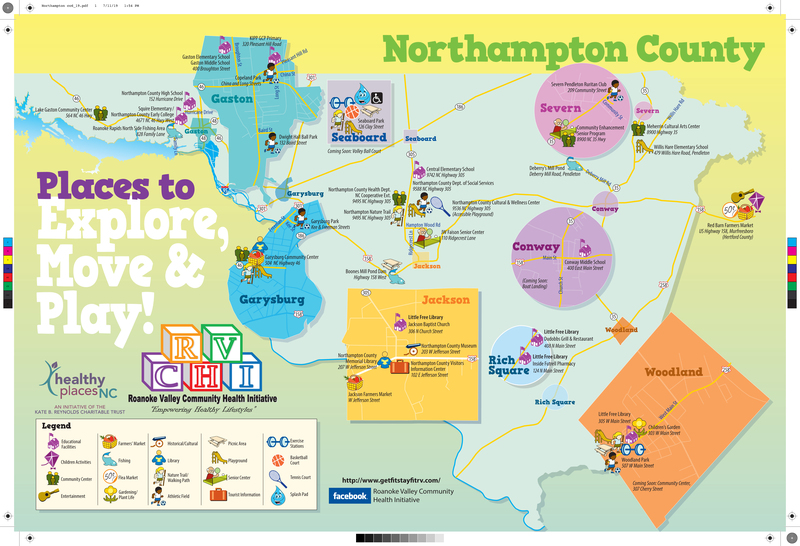 For example, indicators for both Northampton and Halifax Counties reveal a low rate of access to recreation facilities and a very low percent of low-income residents have limited access to healthy foods. 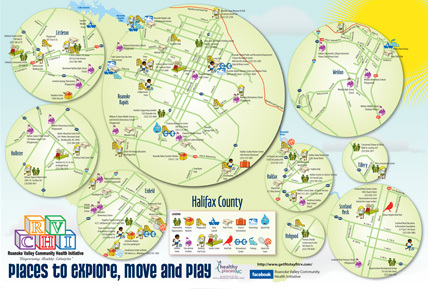 The Places to Explore, Move and Play map is one step in the right direction to change the picture of health in the Roanoke Valley by promoting parks, farmers markets, playgrounds, senior and community centers to name a few. Creating the map was a collaborative effort of the RV-CHI partner organizations. 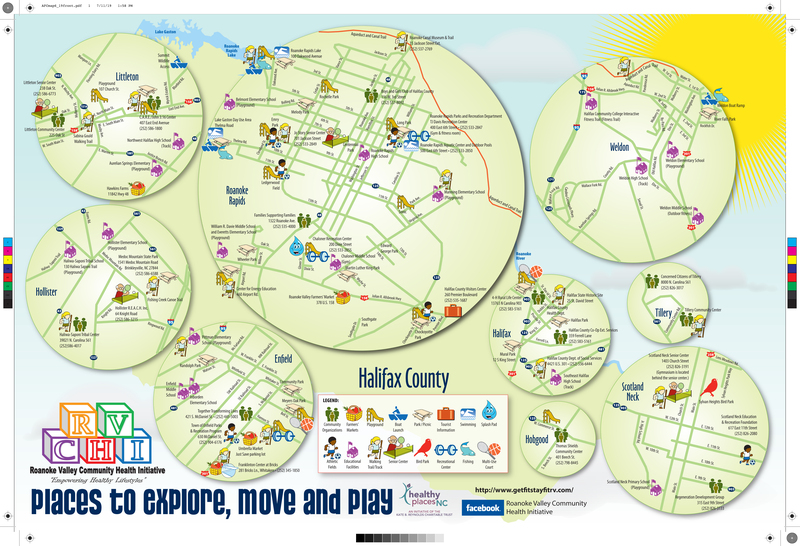 Input to create the map came from a range of diverse organizations all focused on the common goal of empowering residents to adopt healthier lifestyles. The Places to Explore, Move and Play map is not intended to be static. As the RV-CHI expands and works with more partners across the Roanoke Valley to identify spaces, organizations, and activities that encourage healthy eating and active living, the map will surely grow.